You can choose to run Freegate in either Proxy Mode, or Classic Mode. Proxy Mode automatically adjusts Internet Explorer's proxy settings so that you can access any blocked website by simply typing it into the address bar. If you're using a different web browser, you'll have to manually change the browser's proxy. You can avoid changing your proxy settings by using Classic Mode, in which you can access web pages by launching the Dynaweb homepage in your browser, although some site content may not display properly. Freegate does not require installation. Once downloaded and launched, you can change the settings of Freegate to access some, or all, web addresses using the Freegate Proxy. If you choose to access websites directly through the Freegate proxy, you'll have to change your proxy settings (in most cases, they will automatically change for you, depending on which browser you use); if not, Dynaweb will automatically launch in Internet Explorer so that you can access blocked sites. 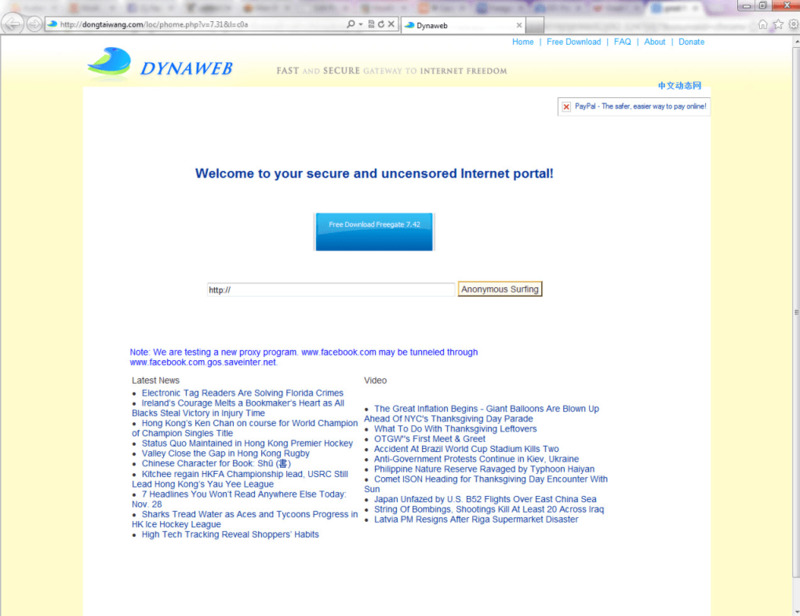 The Dynaweb interface isn't particularly nice to look at, but it does the trick. There are four tabs that will give you information about your connection, including Server, Status, Tunnel and Settings. The Server tab tells you which server you are using, as well at its connection speed; the Status tab will tell you which tunnel you are using and gives you the proxy settings, as well as the option to turn the software off; the Tunnel setting lets you choose which tunnel and mode (Proxy or Classic) you are using; while Settings lets you change things like deleting Browsing history and other program settings. If you're new to this type of software, it might be confusing to wrap your head around some of the terminology, but its ease of use and default settings on launch make it relatively straightforwad to start browsing. If you're in a region that has censorship restrictions, like China, Freegate is a good software to get around these restrictions and access blocked websites like Facebook and YouTube.